It has different social and economic groups, fetishists of every kind, denizens of every hour of the day, kindness and meanness, happiness and fear. 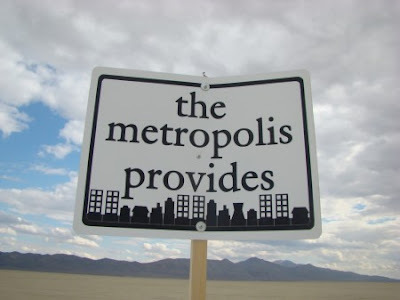 It is largely but not exclusively middle class and white, but that is a subject of discussion and debate, not unlike the real metropolis. Gender and sexuality are very much on display and open for debate, in both cases in much more intense levels than in the ordinary world, both for good and bad. It has an economy, one based on deeply rooted forms of capitalist exploitation and fossil fuel dependance, and like the real world, this too is largely ignored by most people. regular landscapes of art cars, theme camps and villages within the city. As Greg Scruggs notes in a recent post on Burning Man, the bike culture is strong, and it feels at time as if BRC is a glimpse of the possible - it's utopian elements are hard to ignore, and the striving of many of the participants for the utopian fantasy is obvious at every turn. BRC is in some ways the perfect place to think about cities, for the strains of the theoretical and the practical merge at every turn - from a conversation about solar power one can easily lapse into a Benjamin-esque conversation about the temporality of the urban, especially on the last night as the city dissolves in front of you. It is a space where flaneurie and grey water are of equal importance, where one can shift from a discussion of shade structure architecture to a debate about the liberal and anarchic underpinnings of BRC's self-declared radical self-reliance. By wearing it's contradictions and challenges on its sleeve, Burning Man is the ultimate fantasy playground for the urbanist, allowing both intense joy and incredible self-reflection, both about the self and the city. And just like the greatest cities in the world, it is a place of incurable romance. Or at least it can be, especially if you are lucky enough to fall in love while you are there. 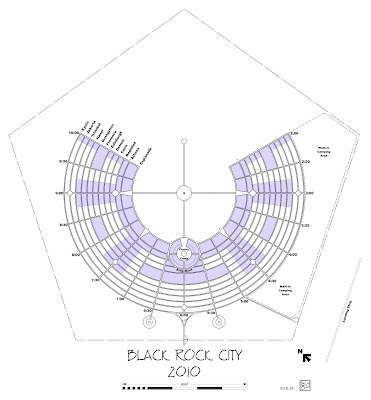 Credits: Image of BRC from burningman.com. Image of sign from Dave Scruggs.